I have been wanting to post about my daughter’s crochet projects for awhile. I thought today I would take the opportunity to show off some of her work for Show and Tell Friday. My daughter loves to crochet and has been crocheting for two years. She loves it and has quite a talent for it. The amazing thing is she is only ten. I know I am her mother but I think she has a pretty special talent to be doing the crochet work she does at ten. She has recently started her own “business”. She has the opportunity to place her work in an antique mall. We have started a blog for her so that family and friends can see some of her work. You can visit it her site Briannas Creative Crochet. We also made business cards/tags to attach to her work. Catherine helped us with the design of both the blog and the cards. I think she did a great job. 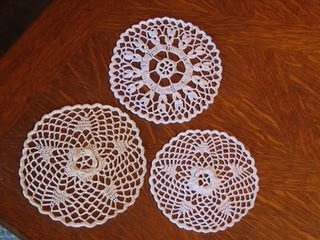 When we visited family in OR recently she had twenty four doilies ordered. She is already busy working on those. These she has finished, starched, and ready to go. These are finished but still need starched. She is working on two more now. She also made me a table center last year for Mothers Day. I hope you enjoy seeing her work. Your daughter found a new talent which she excels at! Thanks for sharing. She did a very good job! Congrats on your first post. She is quite talented! Beautiful work. Great show and tell post!! That is amazing. She has quite a talent. I couldn’t do as well and I am…well, we won’t go into that! She does a beauitful job! She’ll have many years to enjoy this. This is a great first time show and tell. Welcome! Your daughter is very talented. I remember learning to crochet when I was in the first grade. I learned to crochet around bathcloths, then add edges on pillow cases. I remember how much work it took to do the type of beautiful work she is doing. What a talented young lady! I’ll have to tell my readers about her. She is sooooo talented for her age. They are really pretty. I wish her well with her new business. I love crochet! I can’t do it, but I love seeing it and being amazed! Beautiful work! WOW! I know you must be so proud of her! I have a personal belief that when God gives us such wonderful talent it is normally exhibited at an early age. Thank you for sharing. Thank you all for your kind comments about my daughters work. She loved reading them all! 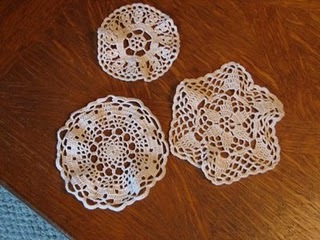 I learned to crochet doilies when I was about that age. I think it is very unusual for today though. I think it is great that your daughter is doing this and enjoying it. Hey, Welcome to your first Show and Tell Friday! What a great job she did on those doilies. I am still trying to learn to crochet! What a talented young girl. Love seeing her work. Welcome to Show and Tell. Your daughter does beautiful work. It’s wonderful that she’s learned to crochet at a young age.